Lately I have plunged back into handmade crafts. 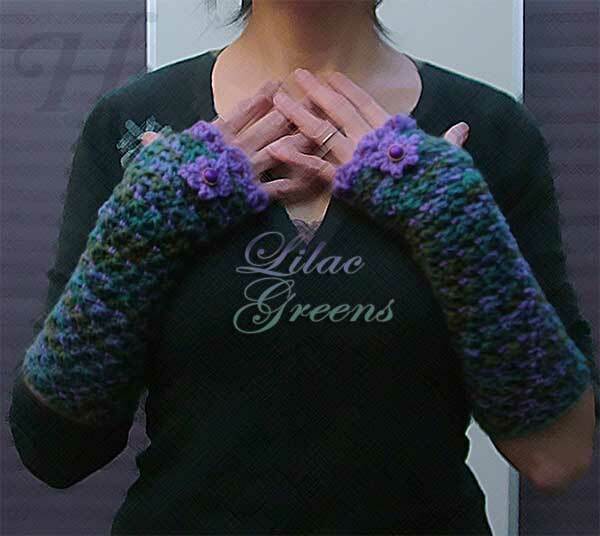 I seem to be on an unexpected production roll in making fingerless gloves. Previously I was writing up on each but as the production seems to be continuing, I have decided to put all of these on one page, for the convenience of you and me. Most of the yarn I have used here are hand wound and spun - from a community of women working for their livelihood in Nepal. 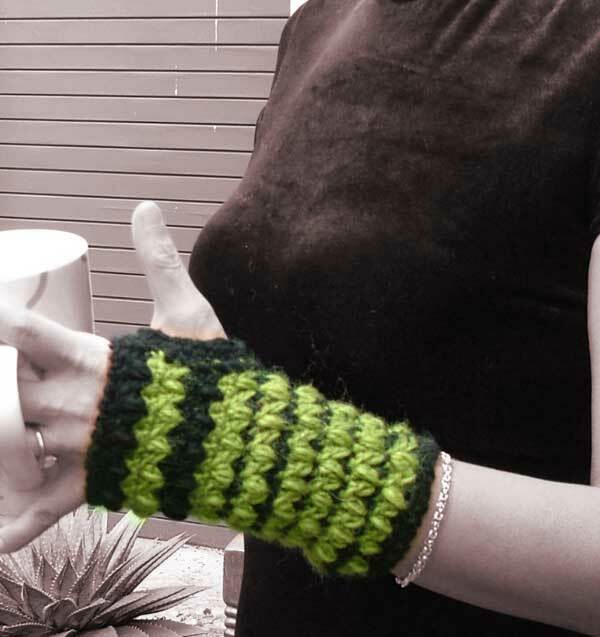 I have used a variety of stitches to make the gloves - otherwise I find it so boring to keep reproducing the same thing. You will be able to pretty much decipher the different stitches or better yet, just use whatever crochet stitches you would like to play or experiment with. 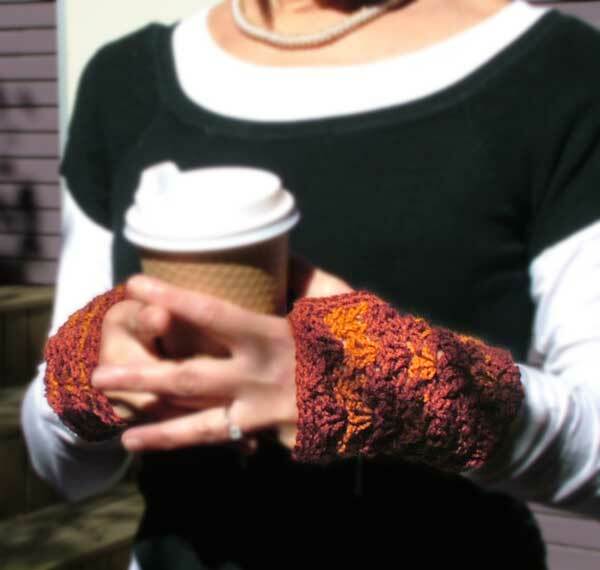 Fingerless gloves or hand warmers (sometimes also called "gauntlets") are extremely useful for just about anyone on a chilly wintry day. 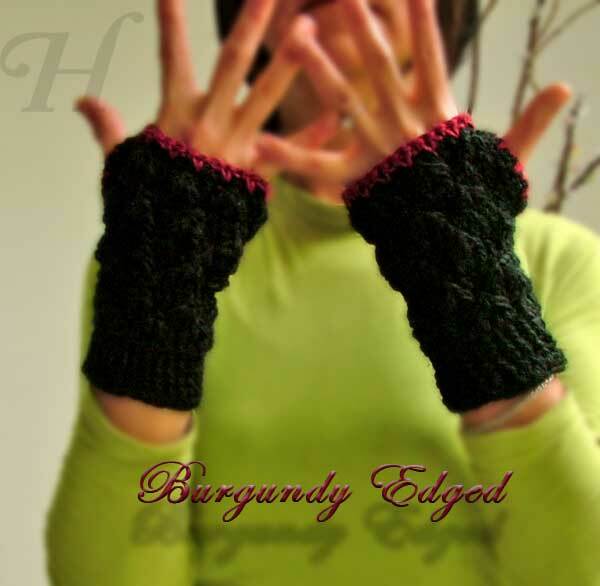 They are super easy to wear and they keep your hands AND fingers remarkably warm and flexible. 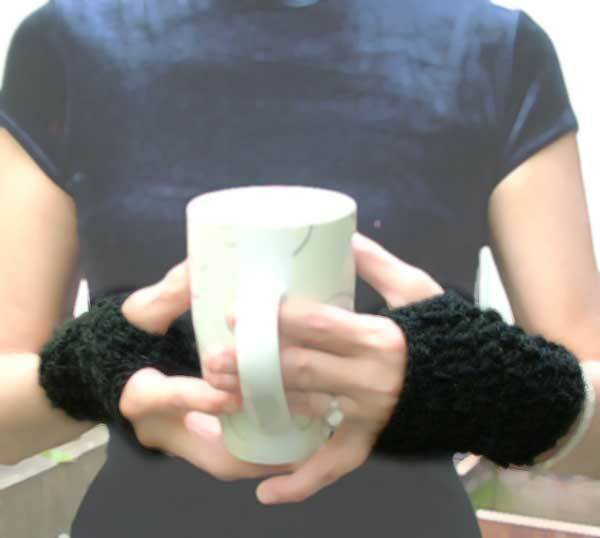 Whether you are an artist, pianist, jewelry maker, or just out for a walk with the dog - hand warmers allow you to keep on going with unfrozen fingers. The 100% silk, 100% wool yarn, pure viscose have been wound by native women in Nepal. They are from a community co-op that helps to provide work and independence to these women. For the smaller photos, just click to view more details. 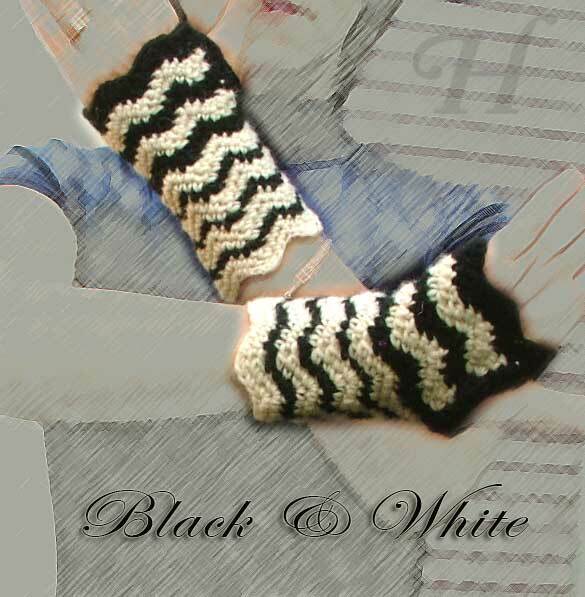 Black & White Stripey has a touch of cool elegance - as is almost always the case when you have classic BW combination. 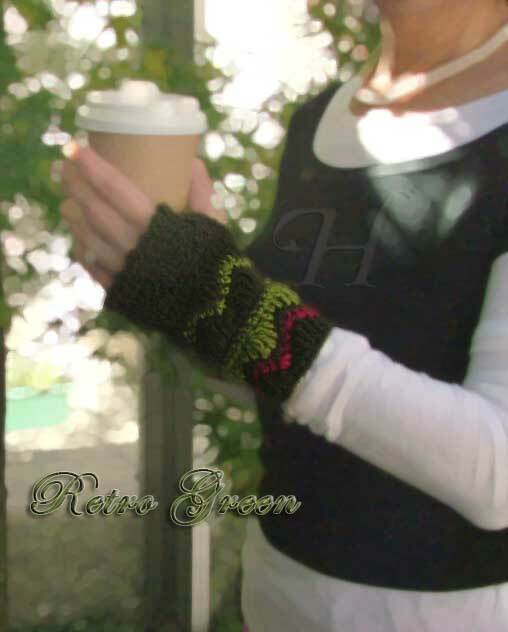 It is done is an accentuated chevron stitch giving the gloves a lovely wave at the edges. 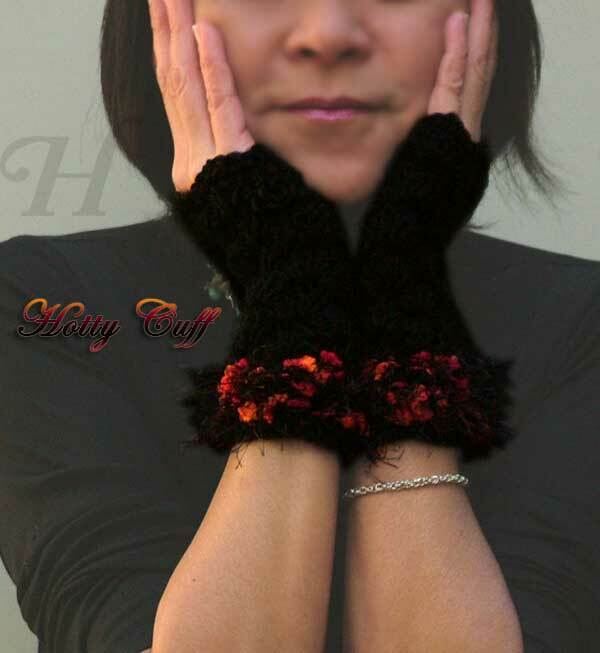 Please read Care/Maintenance of handmade gloves. 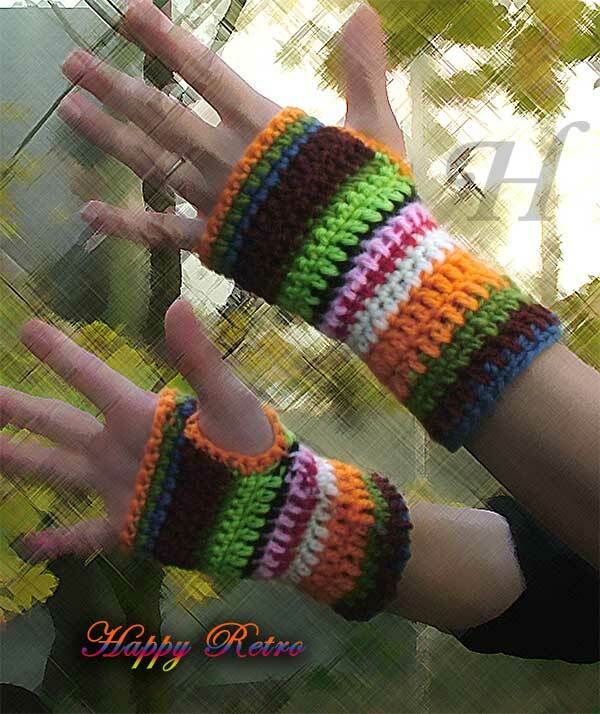 I have made use of a variety of crochet stitches to create these handmade crafts/ fingerless gloves. All you need is some stitches of your own. 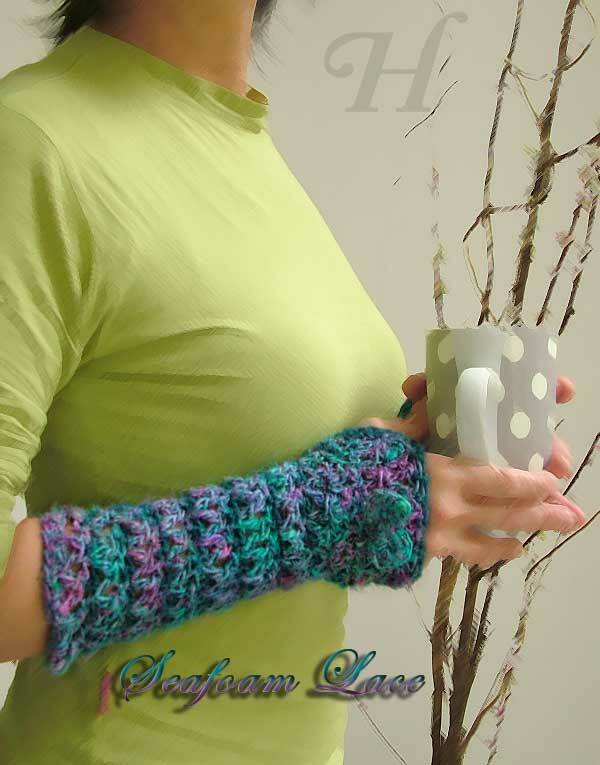 You can find a multitude of books on Crochet at the most trusted store. 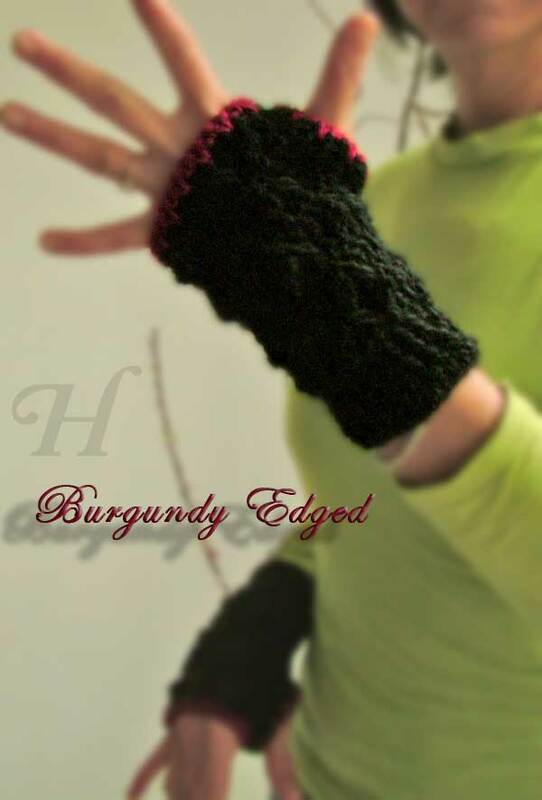 Black Textured gloves is definitely for the no nonsense practical go-getter. Matches anything and features soft texture for warmth and classic style. 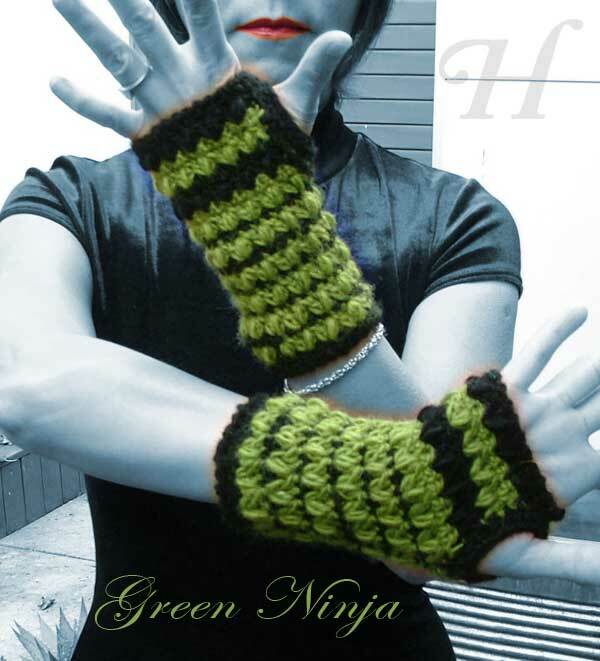 I have named this the Green Ninja fingerless gloves coz for some reason, it brings to mind - yup, you got it - a ninja!!! Practical, Daring, Powerful! And most definitely warm!!! 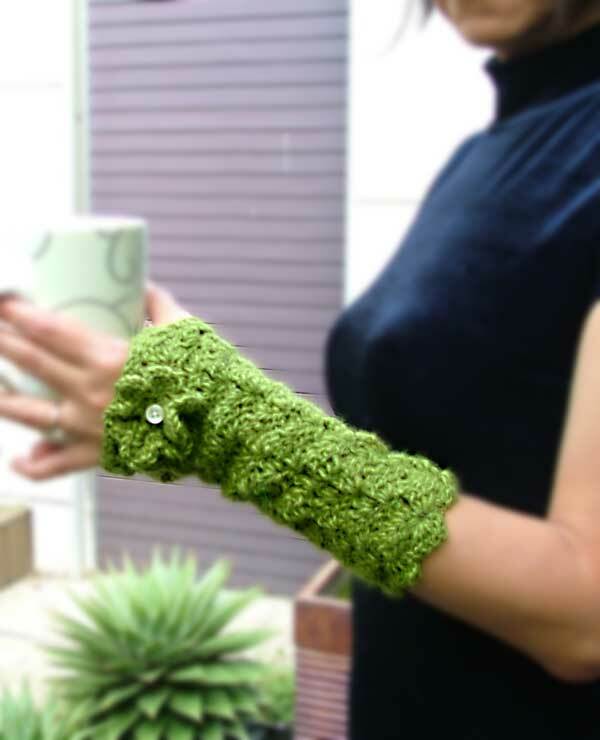 Need to be green, warm, and feminine? Then this is superbly you! 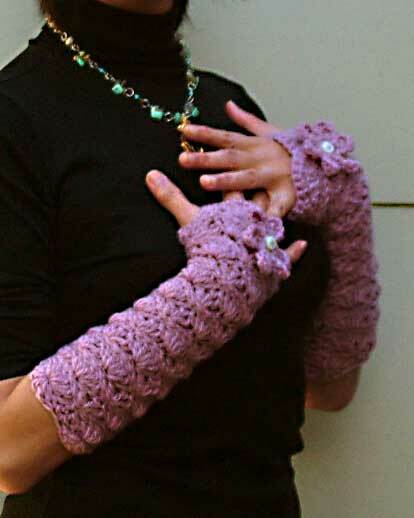 Made in a close lace stitch, embellished with matching flowers and buttons, this finglerless long gloves will keep you warm and deliciously, flourishingly comfortable. 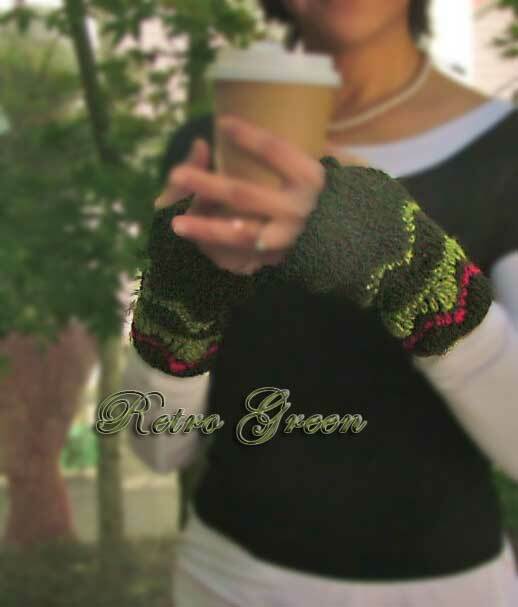 A pair of long, warm, and feminine fingerless gloves for a winter's morn. The center of the flower is made with pale lilac velvet ribbon, with some of the same showing through as strand-embellishment under the flowers. 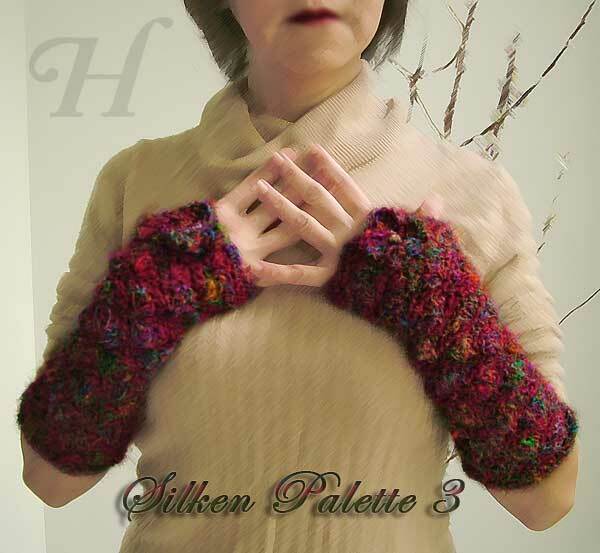 I loved the colors of this yarn so much, I made another pair of these fingerless gloves. In a shorter version and with pink highlights. The flower is made with mohair blend yarn and is done in loop-crochet. For a riotous touch of silk - these gloves, made from 100% recycled silk, hand wound by native Nepalese women - gives pure warmth and colour to any dreary, wintry day. Made extra warm for class and cover, it will brighten and cheer. Highlighted and edged with vibrant turquoise blues. I am running low on my stock of Silk Yarn in this particular color combination. This has proven to be a popular item. This is commission glove in Medium size. Each of these are unique - the stitch pattern used is different and so is the embellishments. This pair of gloves is made short by request. 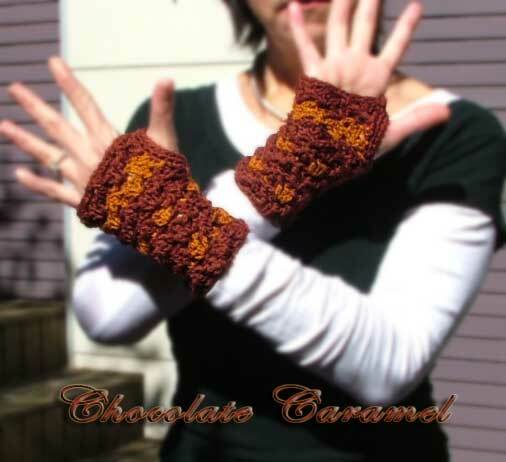 Chocolate Caramel crocheted gloves is yet another handmade crafted item to beat the cold of winter. 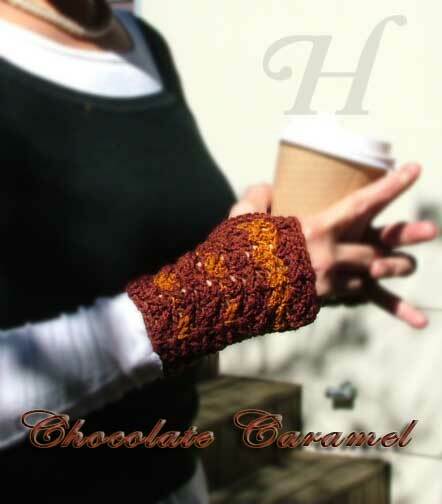 Made in warm creamy, chocolaty colors, it already looks warm and inviting. 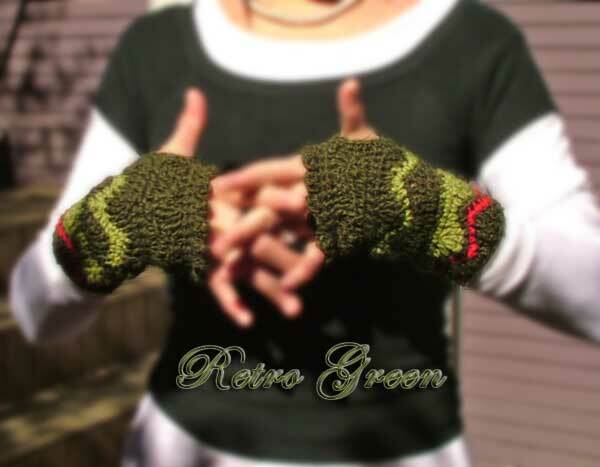 Retro Green handmade crafted crocheted gloves has the touch of warm nostalgia with chevron waves. 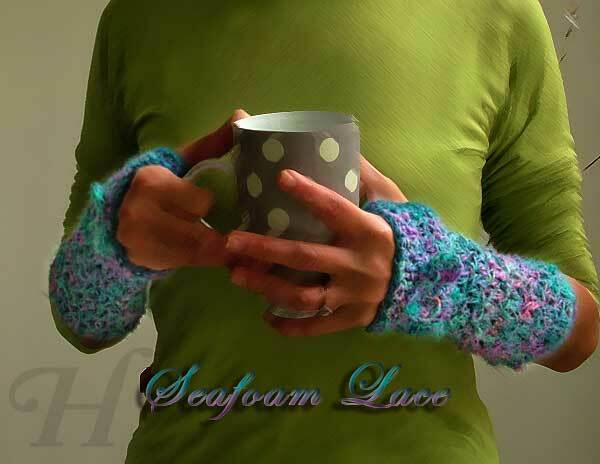 Made with warm, close stitches for even more warmth and coziness. 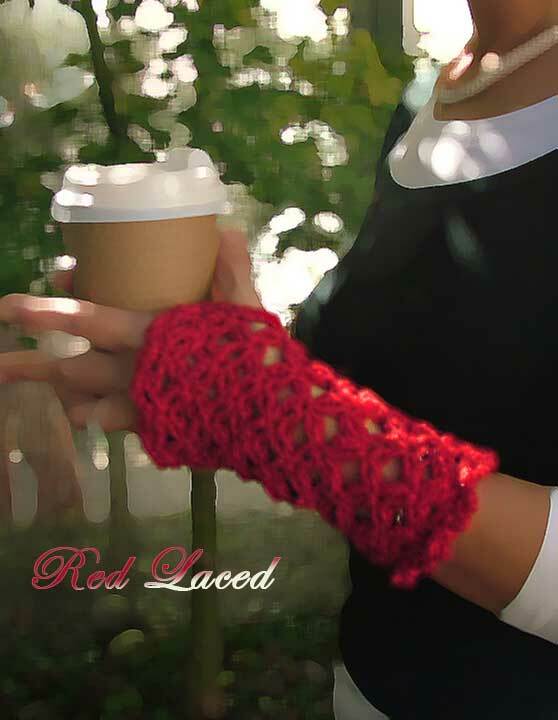 Red Laced handmade crafted crocheted gloves is both feminine and openly racey. It is edged with little scallops on the edges and is perfect for coolish days and when one might like to look feminine yet gently assertive! 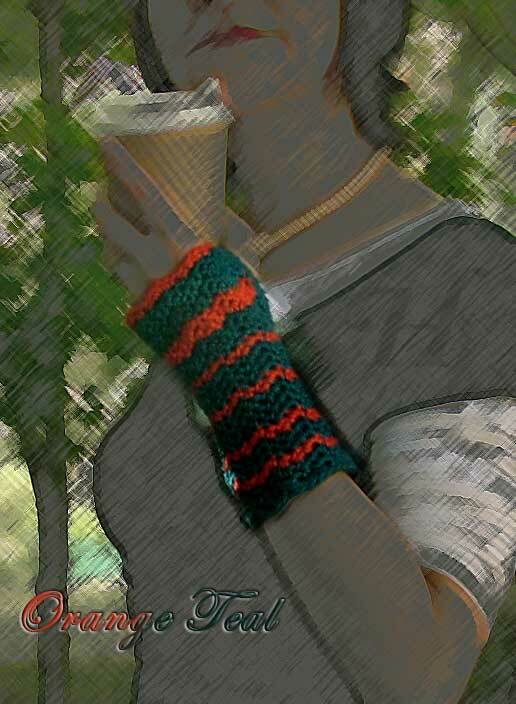 I really have to add a special note to these Orange Teal handmade crafted crocheted gloves. 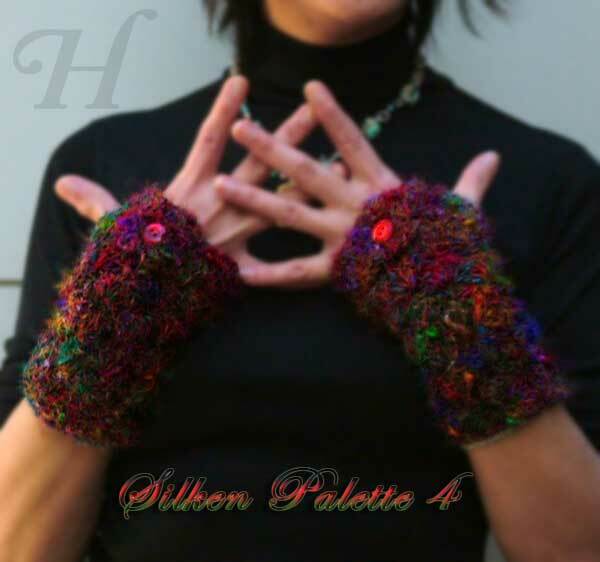 I used Viscose yarn for these gloves but was not sure how it would turn out as the yarn does not have the stretch of woolen yarn. However this yarn took me by surprise - and very pleasantly so. This yarn is more expensive and is one of my Favourite-est yarn; I just love viscose. Viscose is a man-made yet natural yarn (made from pulp and cellulose). It has the drape and silkiness of silk and can breathe, just like natural cotton. It is a perfect combination of the best of both worlds - and I love working with it. 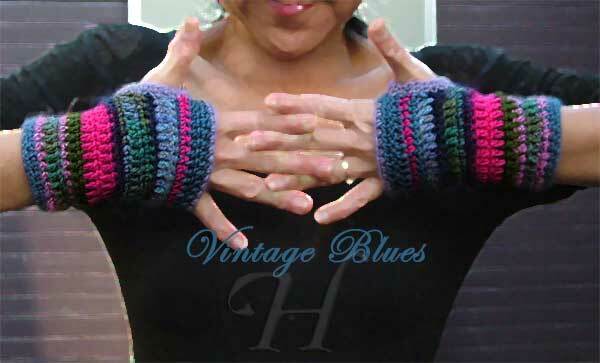 And in the use of this viscose yarn for these fingerless gloves, it has proven that it is almost more perfect than wool. 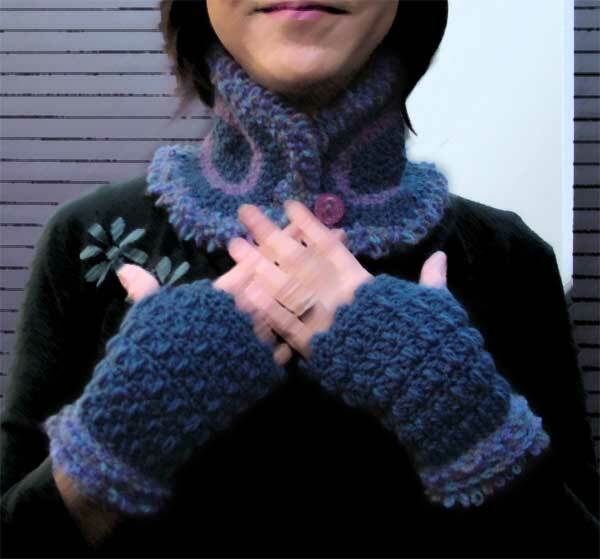 Despite the yarn being less stretchy than wool, yet when it is made up, the gloves seem to hug the hands themselves. Perfect! So in effect, the whole material stretches while being put on and then it reforms to hug the hands, increasing the level of delicious comfort and fit. Still my very favourite yarn! 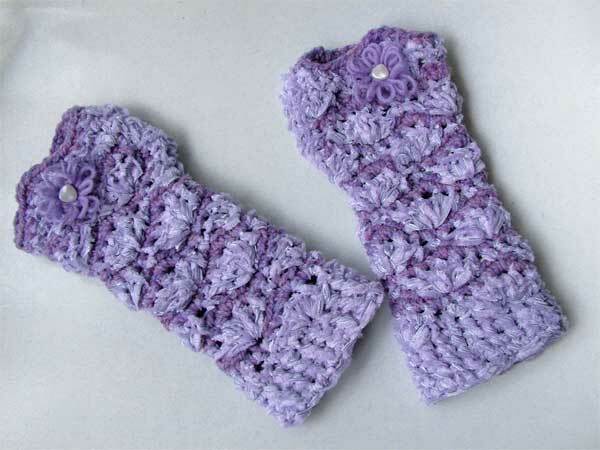 Another pair of gloves done in my favourite viscose yarn. Soft and supple - viscose yarn is definitely No.1 ! 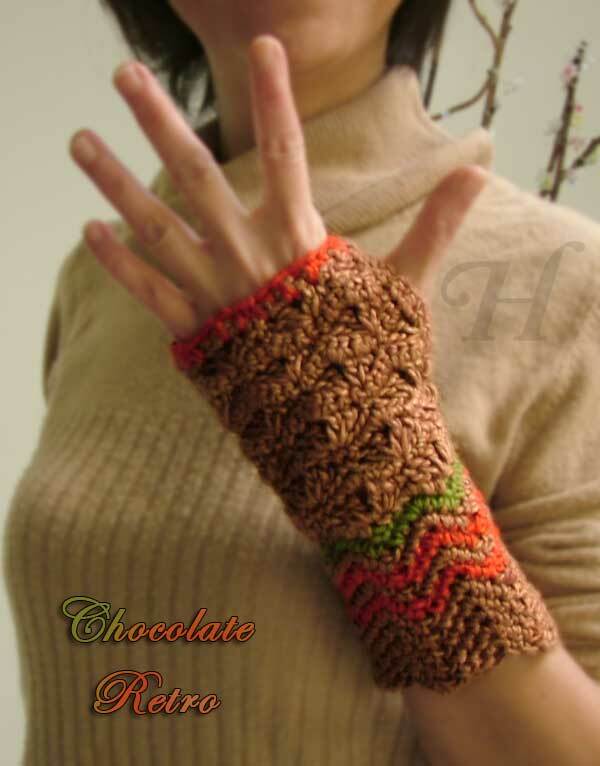 This pair of fingerless gloves is in the warm shades of chocolaty brown with strains of retro nostalgia. 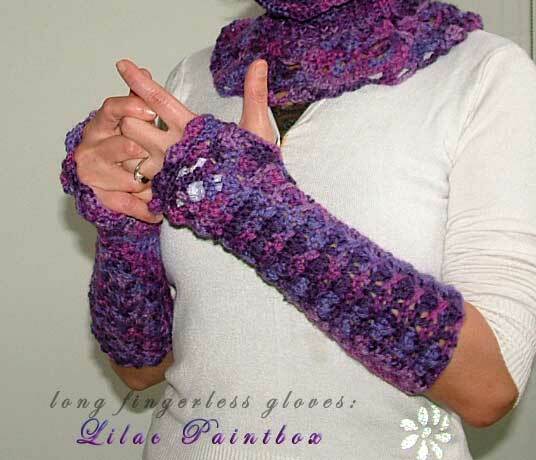 A commissioned crochet fingerless gloves, size large, made in Silk Yarn - another handmade crafted long set of gloves. 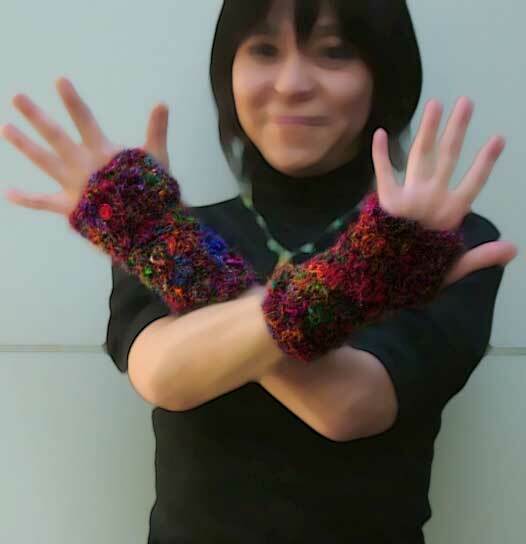 As with all the fingerless gloves, they are ideal for anyone feeling the cold and is great for anyone with a touch of arthritis. The gloves provide warmth and mild support. And they look deliciously cool! This silk yarn is recycled silk that has been spun and rewound by a community of ladies in Nepal. This community gives them a means of finding livelihood and some measure of financial support for themselves and their families. Plus, I love recycled stuff - Be Kind To Our Loving Planet. 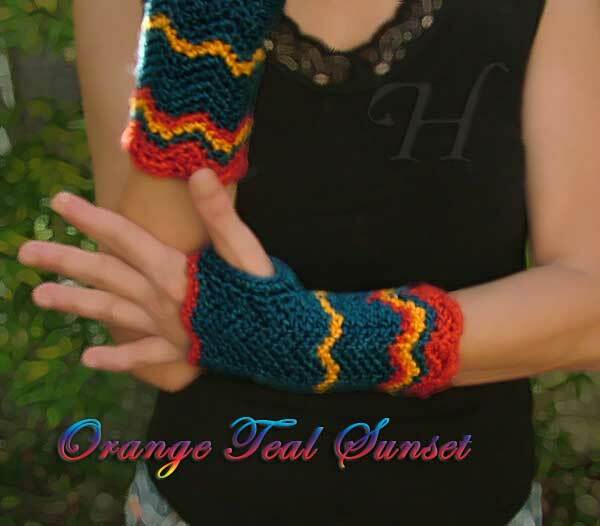 A commissioned set of gloves made in the delicious colors of sunset - Teal, Orange, and Golden Yellow. 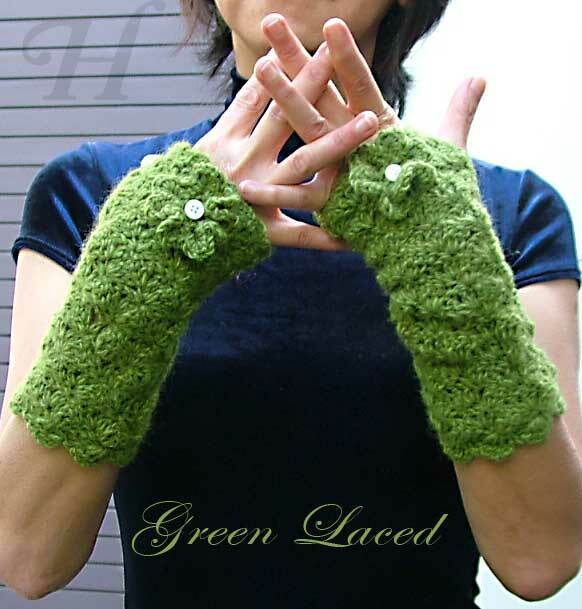 These pair of gloves is made from my favourite yarn: viscose. It breathes like cotton and drapes like silk. 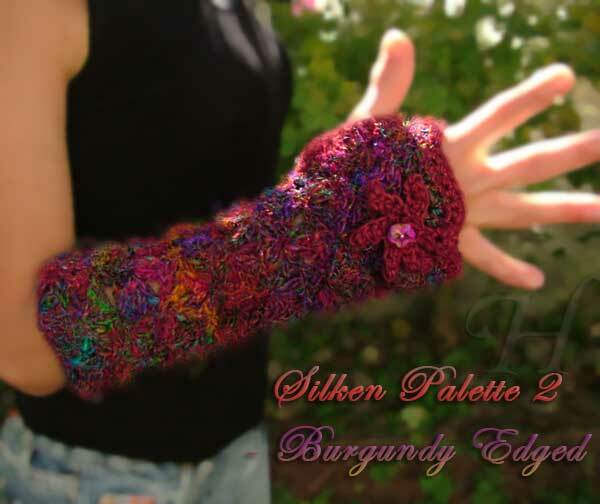 And the wearer will find delight in the gloves when worn as the crocheted material will seem to reshape and lovingly hug the hands and wrists. 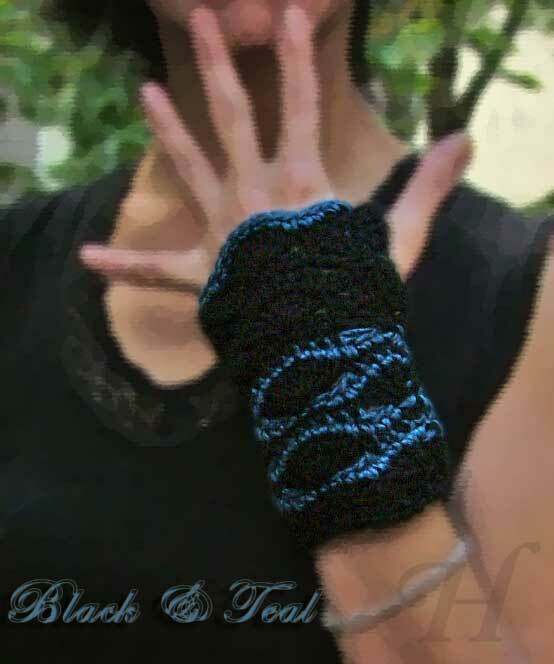 This pair of crochet fingerless gloves is made in the warmth of pure 100% wool and edged with the vibrancy of Teal viscose yarn. 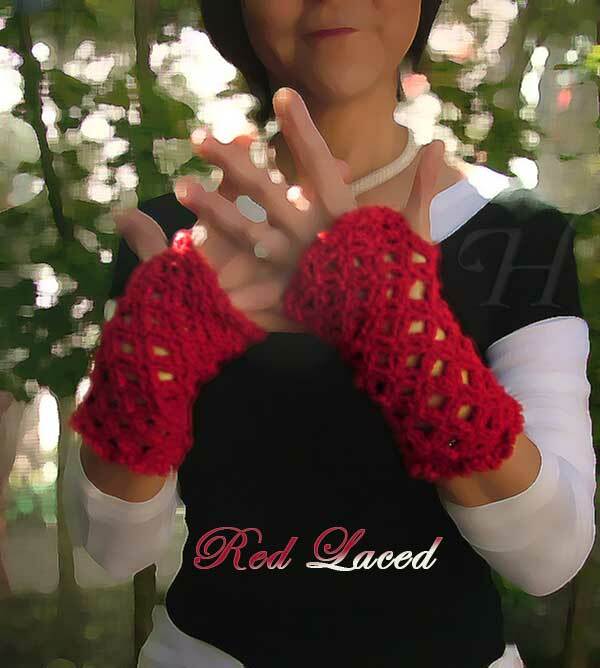 This pair of crochet fingerless gloves is made in the warmth of pure 100% wool and edged with the vibrant warmth of Burgundy viscose yarn. This is a commissioned piece. 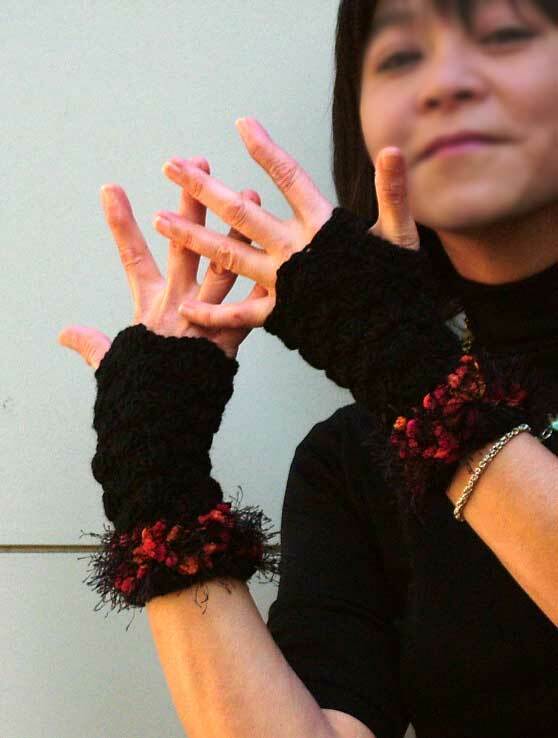 This long pair of fingerless gloves is made in 100% recycled silk yarn, hand spun in Nepal. Worked in a lacy look with warm gentle lines of viscose yarn (Teal) and topped with a rounded crochet bow. For the dainty girl who loves the waves on a windy sea-foam day. 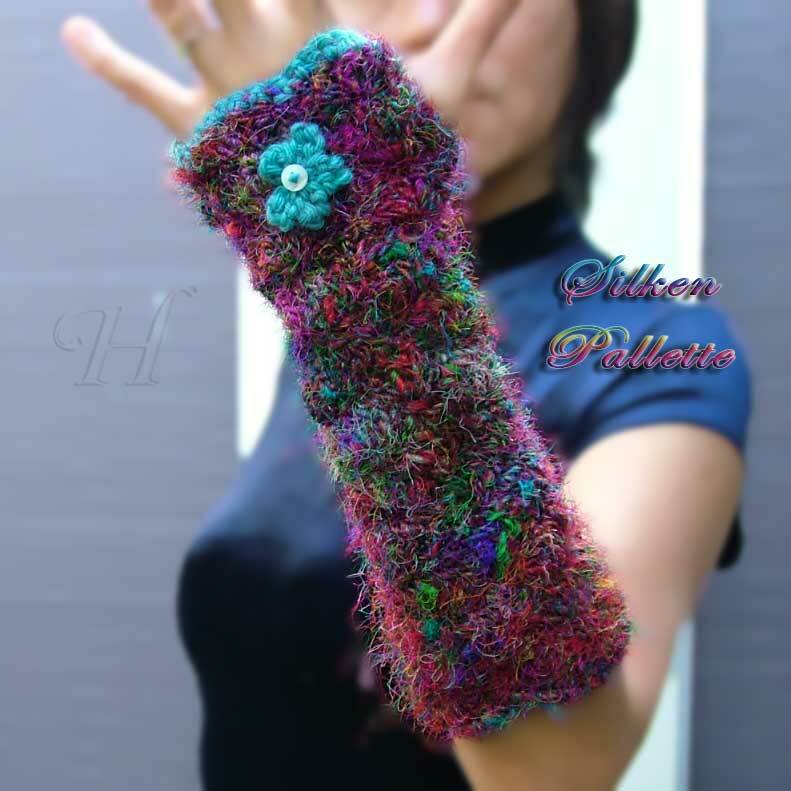 Lovely Abbey sent me a bag of yarn and I used one of the loveliest in that lot to create the cuff for this pair of fingerless gloves. 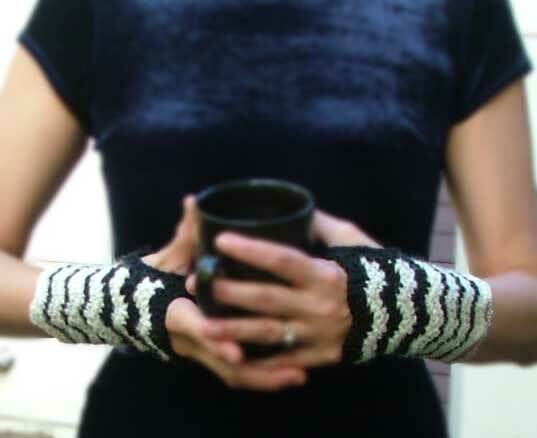 The black yarn is 100% handspun (feltable) wool from Nepal. 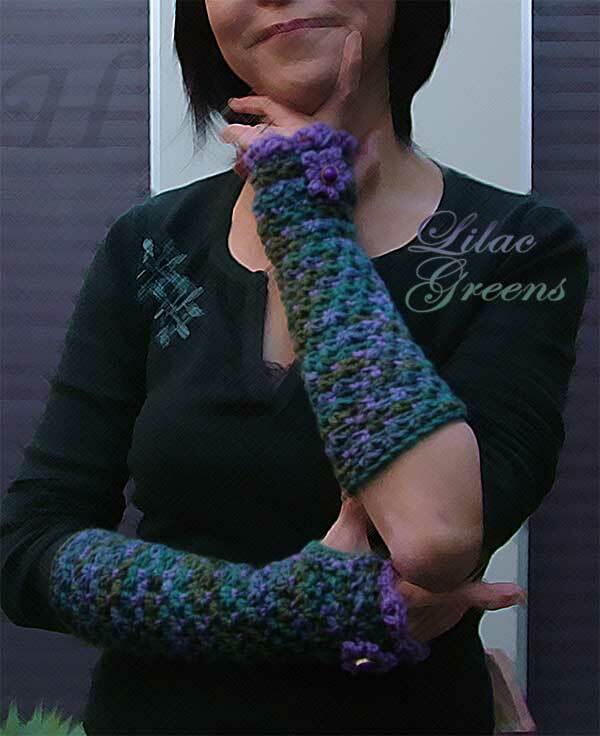 I was asked a little while ago to make a small pair of longish gloves, something in the purple-range. She was originally looking for something like the Long Romance (sold, with no replacement yarn). Since then, I have been buying bag after bag of yarn in what I thought was in the purple range. I am a 99% internet shopper and one of the downfalls of that is that what one sees on the monitor screen is not necessarily what it is in real life - especially when it comes to colors. I got this Cleckheaton Velvet Ribbon - in pale lilac but it is a tat too pale. So to bring out the color, I added some (100% wool) medium lilac and I think that it does look much better. 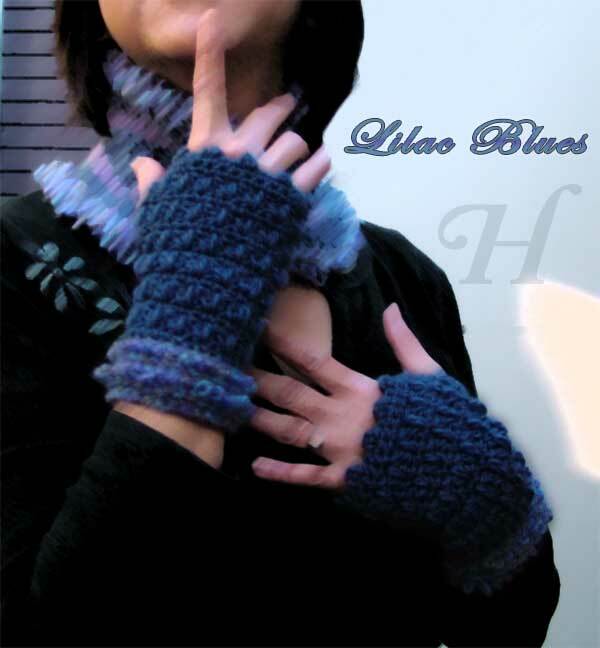 100% pure new wool fingerless gloves for extra extra warmth. I have also chosen a slightly puffier stitch for even more warmth! 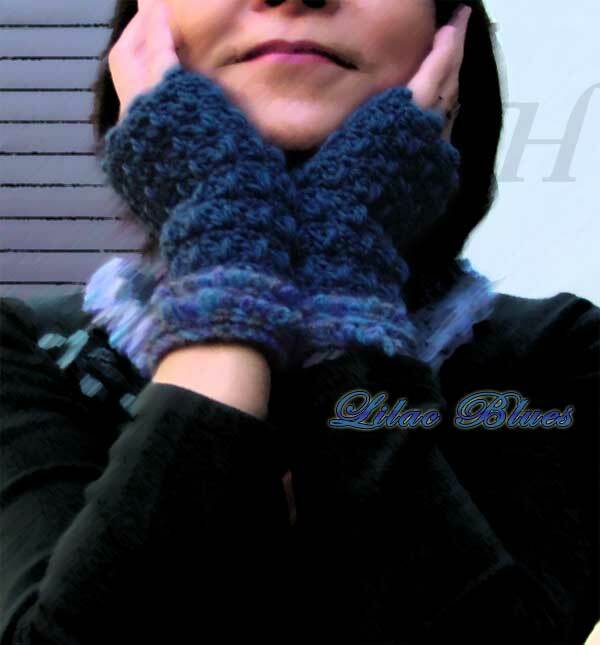 There is a matching "Velvet Blues" neck warmer that goes superbly well with this. On that page, you can read more details about this set of winter toasties. I am listing them separately so that interested buyers have more choice. 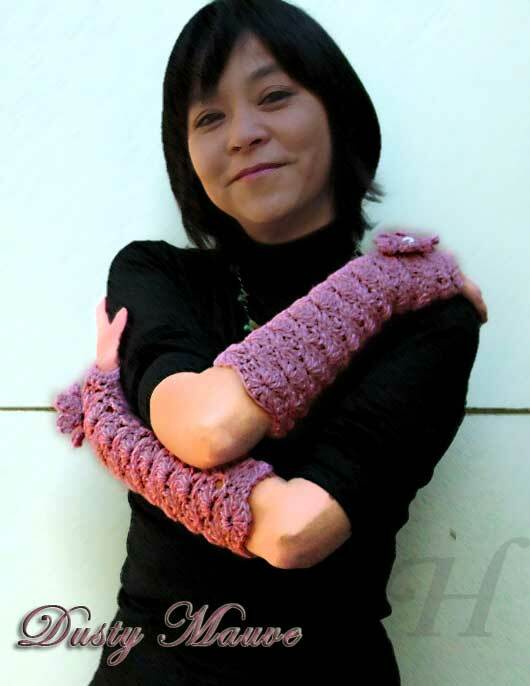 100% pure new wool fingerless gloves, made long for extra warmth and trendiness! 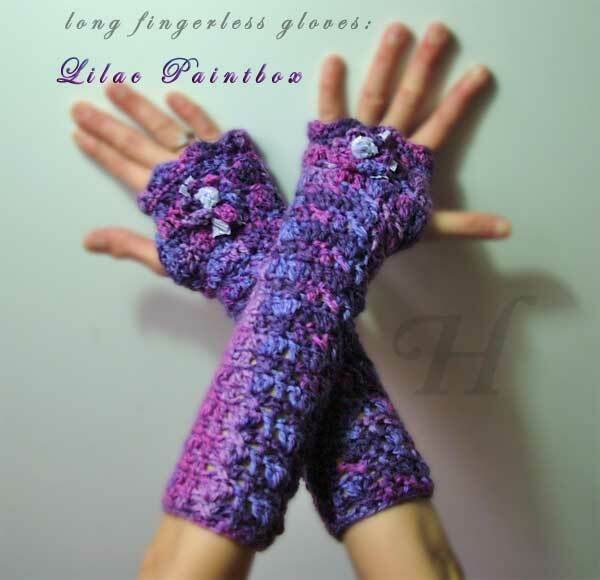 This pair of gloves is worked mostly in multi-colored yarn, with dashes of a solid color (lilac) running through it. 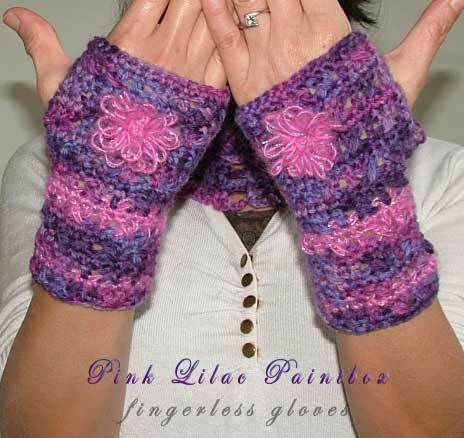 Lilac yarn also tops off the edging and is used to make the decorative flower. 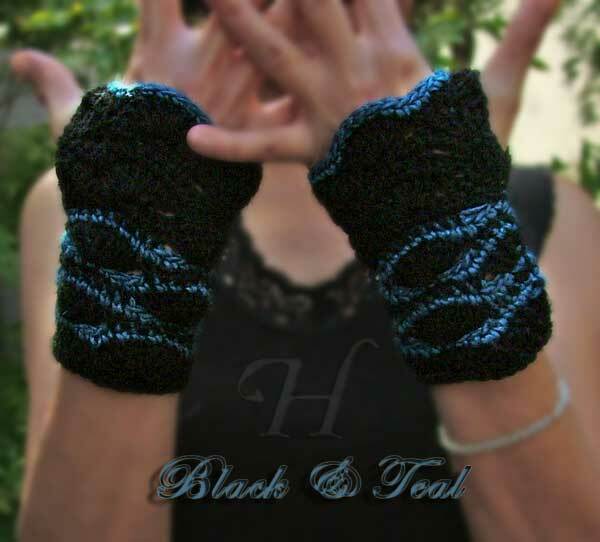 I originally found the multi-color yarn a tat too dark on its own. Using a contrasting but complementary color helps change the tenor of the piece. 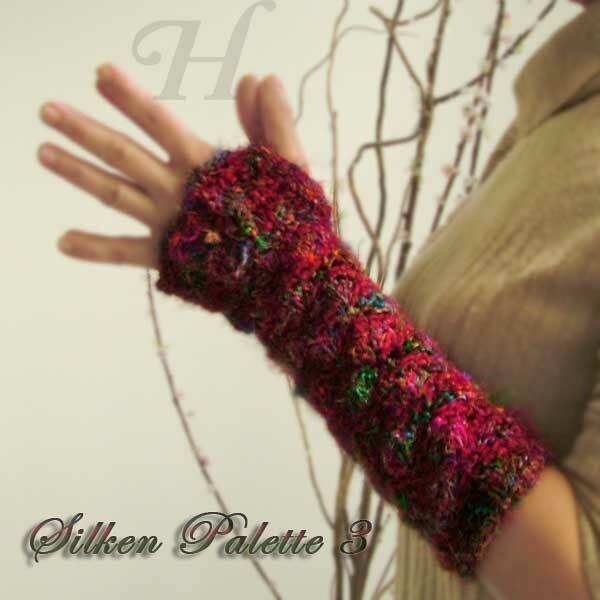 That is the beauty of multi-color yarns. Not only are they interesting and intriguing on their own, but you can add just one or 2 colors to the piece and all of a sudden, you end up with a different color scheme and feel. Hence you can come up with lots of different 'color combos' with multi-colored yarns. Very handy and versatile! Not just Retro, but Happy Retro! I love retro colors and this one, in bright colors, is a celebration of the delectable retro look as well as a warm against the gloom of a winter's chilly bite. 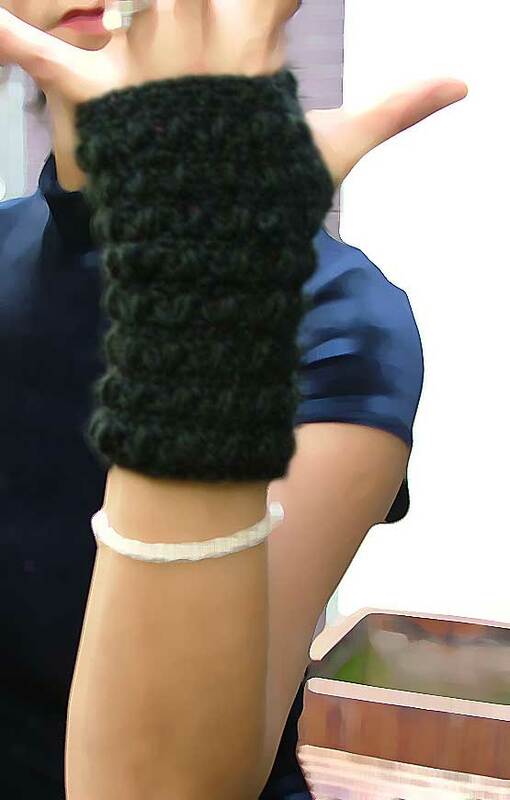 100% pure new wool fingerless gloves. This pair of gloves is, almost always, in the rounds so that you don't end up with unsightly seams. 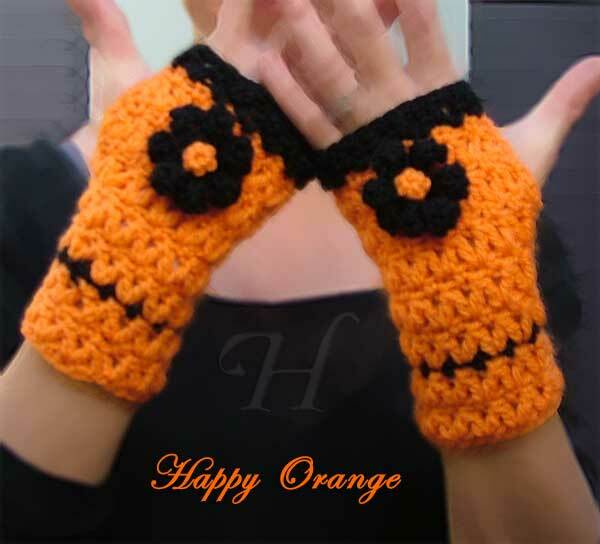 Bright and Happy - that is what this Happy Orange fingerless gloves is all about! Sure to brighten the smile on any face and lighten the twinkle in their eyes. As usual, this is crocheted in the round and is made seamless. 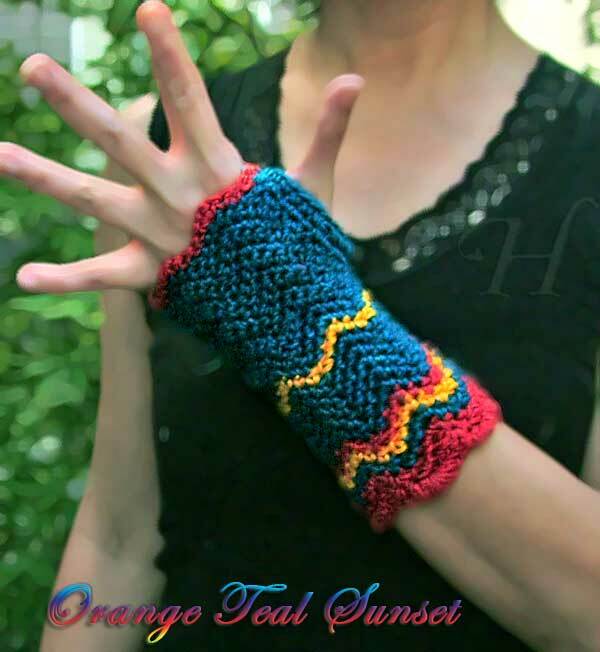 Continuing my love affair with Retro colors, this pair of handmade gloves is more subdued but with splashes of pure vibrancy. Again crocheted in the round without bulky seams. Check out the various books on crochet stitches you can get for your own library.